So, you want to set up a fishbowl, and you’re wondering what kind of fish you can keep in it. Well, first of all, it’s important to realize there is a lot – and I mean a lot – of misinformation out there on the internet. No matter what you read, a goldfish that can grow up to 18 inches in length is not going to be happy in a fish bowl. Sadly, most goldfish probably won’t survive more than a few months in a fishbowl – while they can easily live for a decade or more in an aquarium. Goldfish are pooping and eating machines, and even very large, well-maintained fish tanks have trouble keeping up with their waste. And no, betta fish are not ‘the best choice’ for fishbowls. While many people seem to believe bettas live in nothing more than puddles in the wild, the truth is that they live in relatively large bodies of water, like ponds and rice paddies. And they require tropical temperatures, which means their aquariums must have a heater – something that fishbowls don’t have. But what does that leave then? Unfortunately, the truth is that there is not a single fish in the aquarium hobby that can thrive in a fishbowl. Not one. But that doesn’t mean there’s nothing that can be kept in a fishbowl. Below are some unconventional choices for a fish bowl. Unlike fish, shrimp can be kept quite happily in an unheated fishbowl. Of course, close attention should be paid to the water, as it can quickly fowl if it’s not regularly changed or the shrimp are overfed. But a fishbowl with several ghost shrimp or red cherry shrimp, with several live plants, can be visually pleasing, and provide lots of activity to watch. When choosing the shrimp, it’s best to add juveniles if possible, as they will adapt more rapidly to their new surroundings than adults. It’s also important to only add a handful of shrimp to start with as the fishbowl will need to mature before it can safely support more shrimp. A few aquatic plants that will work well in a shrimp bowl are Java moss, Java ferns, hornwort, anacharis, and marimo balls. Make sure to plant heavily, as the plants will help to keep the water stable and clean. Another option for a fishbowl is a planted snail tank. While not everyone appreciates snails, there are several small species that have quite striking colors and are interesting to watch. And while large snails like apple snails and mystery snails are out, there are still several species that will work. 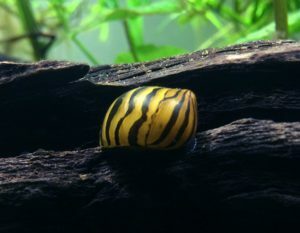 These include – nerite snails, Malaysian trumpet snails, pond snails, and ramshorn snails. Though with Malaysian trumpet snails and ponds snails, overpopulation is a real risk. The fishbowl should contain aquatic plants with sturdy leaves that the snails are unlikely to consume. These include anubias, hornwort, Java fern, and Java moss. 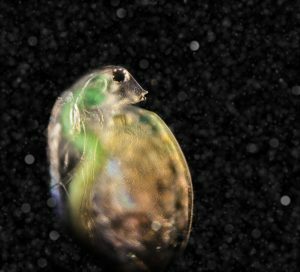 Even with duck lips, daphnia still look good in a fishbowl. Probably the most unconventional idea on this list, a live culture fishbowl can be incredibly interesting and even attractive (to some). But if you’re new to the hobby, you might not be familiar with live cultures. In the aquarium hobby, many people culture live foods to feed to their fish. These include brine shrimp (sea monkeys), daphnia, blackworms, and cyclops. And all of these can be raised in a fishbowl. They may require a bit more work than the other options – since brine shrimp require saltwater and daphnia need to be fed green water – but it’s incredibly rewarding raising these small creatures. And as an added bonus, they can be fed to your other fish when the population gets too high in the fishbowl. 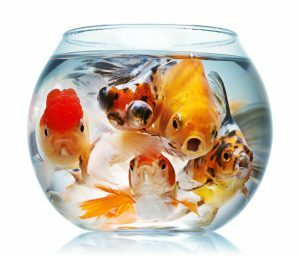 While it may be disappointing that there are no fish that can be safely kept in a fishbowl, this list shows that there are still other options out there. Options that won’t make any fish suffer in filthy and cramped conditions. And each of these ideas is just as interesting as a fish in a bowl – though truthfully, blackworms aren’t nearly as attractive (but still fascinating to some aquarists). Thanks. Planted shrimp bowls can actually look amazing. I had a ghost shrimp one for years and once the plants were grown out, it was really great.